A new artistic scene had taken shape in the 1960s with its center in New York City. Pollock was gone. Rothko became increasingly embittered and isolated before committing suicide in 1970. Newman, with his gregarious nature, was present in the art world, but we have already seen that his art was intentionally being given a different direction from the one that he believed in. Newman too would die, of a heart attack at the age of 65 in 1970. This might all seem like a very sad story if it were not that these artists left an extraordinary achievement in painting which opened a whole new future to modern art. The drama of the post-war years has largely been how that future would be established. There have been many to argue that the era of modern art was over. A whole younger generation of very ambitious American artists were intent on building careers, relying on promotion and the lure of fame and success, much on the model of post-war American society at large. Similarly, a new generation of European artists would emerge, struggling to recover from the cultural trauma of the Second World War and watchful of these developments in New York. Yet it must also be acknowledged that the artists of the post-war period have all implicitly assumed that they are the heirs to the modern tradition, albeit by inclusion of a supplementary mentor in the person of Marcel Duchamp. It is important for them that they should maintain this position because contemporary society’s fascination with art is in large measure a response to the enormous prestige of modern art over the span of its 200-year activity, from Géricault, via Cézanne, to Pollock and beyond. Yet the vast majority of these contemporary artists have very little to do with the history of modern art or the modern aesthetic as it has been discussed in this essay. One of the distinguished exceptions to this general consideration of post-WWII art, who needs to be prominently cited at this juncture, is a certain Simon Hantaï. For a number of reasons that will be explored, Hantaï had a diferent outlook from many of his generation. Rather than thinking of modern art as arriving at the end of its trajectory, he set about the task of studying its history and intellectual frame of reference with the intention of building on its achievement and of endowing it with a new metaphysical meaning. Hantaï was born in 1922 in a small village outside of Budapest. After completing a Beaux-Arts training, he emigrated to Paris, via an extended visit to Italy, in order to connect with modern art. Budapest was not Cody, Wyoming, but we have the artist’s personal testimony that his early life was extremely isolated. He lived to the age of 16 without electricity. Visual art was absent from his childhood. The cultural artifact in his world was that of the Baroque musical tradition of Heinrich Schütz in the village church, a tradition his Roman Catholic ancestors had brought with them from their native Swabia. To a very great extent, the cultural outlook in which Hantaï grew up had remained sealed in a microcosm of that Reformation culture. During his student years, Hantaï encountered the great history of art as it was presented in the Budapest Museum of Fine Arts. It is interesting to visit that institution today in order to see what paintings would have been on view for Hantaï in the early 1940s. There is a group of very beautiful El Grecos that greatly attracted Hantaï (fg. 62). 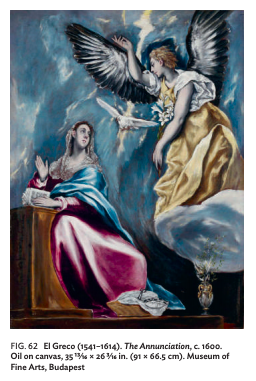 Pollock had had the same affinity for El Greco on his visits to the Metropolitan Museum during the thirties. Among modern artists, Hantaï was able to see Bonnard (fg. 63). He also mentioned that as a peripheral European capital, Budapest was keenly interested in learning of modern culture and developed in the interwar years a milieu of little magazines and a thriving industry of translation with, as he recounted to this writer, chapters of Joyce’s Finnegan’s Wake appearing almost contemporaneously to the English publication in Paris. Hantaï lived through the war and foresaw the menacing arrival of Communism in Hungary. As a student leader in the Beaux-Arts school he had helped draft a manifesto of articles for a free and modern cultural life that was presented to Georg Lukács, at the door to his apartment. Lukács would later briefly serve as minister of culture in the pre-Soviet Hungarian Revolutionary government of 1956. Lukács cast his eye over the list of demands, handed the document back and said, “My poor friend, come and see me in 50 years,” a pretty accurate prognostication as it would turn out. Hantaï recounted that he went home to his recently-wed wife, Zsuzsa, and announced to her that they were leaving. After an extended visit in Italy, traveling often on foot to visit the great sites of Renaissance art, they made their way to Paris. During these early years in Paris, Hantaï was casting about in order to find the direction he should take in his art. The decisive influence would be the new American painting, with Pollock as the focus of his interest. The American artists were not visible in Paris at the time. Pollock’s exhibition at Galerie Facchetti did not take place until 1952. Hantaï turned to his older surrealist associates, notably Breton and Duchamp, for information about what was happening in New York. The story of this exchange is now legendary. The young artist, whom Breton wanted to keep in the surrealist camp, was told to pay no attention to America. Hantaï insisted, especially urging the case of Pollock. Finally, Duchamp said to him in exasperation: “All right, if you must, take Gorky as a model, but whatever you do, not Pollock. If you go in that direction you will be lost.” Hantaï followed Pollock and shortly after broke with the surrealist movement. One may wonder why Hantaï, with his great interest in artistic developments in New York, did not move there to be closer to what was going on. The answer to this question may define the character of Hantaï’s response to Pollock and also explain why he, perhaps alone among artists of the time, was able to successfully take up the challenge of Pollock’s example. The answer that became clear from knowing Hantaï personally, and speaking at length with him of his understanding of modern art, was that he did not allow himself to be limited by the formal aspect of Pollock’s painting. Of course, he was attentive to Pollock’s technique and we see elements of poured or dripped paint in Hantaï’s painting of that time. However, Hantaï was above all intent on gaining access to the aesthetic and intellectual content of Pollock’s painting. Paris provided the right environment for him to achieve this. First of all, surrealism had been reestablished there by Breton after the Second World War, giving Hantaï the opportunity to discover psychoanalysis in the same context as the American painters had a decade before. He was able to conclude, as had the American painters, that the apparently transgressive visual hallucinations of surrealist imagery, derived from dream scenes in which classically objective drawing is preserved, could not aspire to connect with the unconscious mind. He was able to discover that the true breakthrough in surrealism, and following in American painting, had been their experimentation with psychic automatism. Paris in the post-war years was a center of intellectual ferment. There were the phenomenological and existentialist currents of thought of Merleau-Ponty, Sartre, and Camus; there was the influence of the linguistic studies of Saussure, with its extension into Lévi-Strauss’s structural anthropology; there was Althusser’s cultural Marxism; there was Georges Bataille’s anti-surrealist philosophy, based in Sade, Nietzsche, and also Kojève’s famous course on Hegel’s Phenomenology of Spirit at the École des Hautes Études; there was the renewal of psychoanalysis, informed by the discoveries in linguistics, of Jacques Lacan; there was a new generation emerging of philosophers such as Foucault and Derrida, and a new movement of literary and art criticism in Tel Quel, led by Philippe Sollers, Marcelin Pleynet, and Julia Kristeva. It is interesting to note that the Tel Quel review began publishing in 1960, the same year Hantaï invented his celebrated folding method of painting, which was his response to Pollock’s technique. This exceptional intellectual context gave Hantaï the means to think through Pollock’s revolutionary aesthetic and, over time, develop a definitive aesthetic statement of modern art that is both complementary to Pollock and its own entirely original achievement. From Budapest, to the cities and towns of Renaissance Italy, to Paris, Hantaï had moved in a context where it was possible to imagine a further development of modern art and thought. This was an outlook guided by a sense of aesthetic and intellectual adventure and inquiry. At the same time, he made the great discovery of American painting and came to understand its contribution to modern art. Those artists, such as Newman, Pollock, and Rothko, had been sincere believers in modern art and felt that they too could make it in the new situation of New York. They understood that modern art did not have to be European, indeed was not essentially European but rather was cosmopolitan, and therefore could be made in America. Pollock had explicitly stated as much. Hantaï believed that, by the same token, this cosmopolitan modern art, being made now by American artists, could also be made in Paris, where its origins in Picasso and Matisse and, going back further, in Cézanne, and further still to all the great names of the modern tradition, could be reaffirmed. Given this context, there could be an emphasis on thinking through the intellectual frame of reference of modern art. This is the task that Hantaï took up in the early 1950s and carried forward through the elaboration of a vast and ambitious body of work that spans the second half of the twentieth century and beyond. The issue of the aesthetic and intellectual content of modern art, precisely the topic of this essay, has always been fiercely contested. Many would deny that there is any such thing and that such a notion commits the sin of literary or philosophical overreach into the prerogatives of visual art. Hantaï did not believe so. To the contrary, his view was that failure to explore the aesthetic and intellectual content of modern art would condemn the artist to derivative mannerism or, worse, to retreat into a provincialism that is the nemesis of modern art. It is important to grasp that Hantaï did not believe in a formalist criticism of modern art, nor did he see art as a vehicle for parochial social recognition and reward. Hantaï also understood, as had Pollock, that for the painter, an aesthetic and intellectual exploration of modern art had to be conducted in painting, not in concepts. Over the decade of the 1950s, Hantaï threw himself into the Paris intellectual debates of the time. It was a murky period in Hantaï’s development. There were two principal phases of his pursuit. The first involved the engagement with surrealism; the second, by way of reaction, the lyrical abstraction of Georges Mathieu. In both, as Hantaï would come to realize, the issue was to find how he could work with the influence of Pollock. In each case, he made the singular discovery that he did not extract the aesthetic and intellectual content of modern art through these avenues but rather became embroiled in ideology. Each time the artist engaged in aesthetic and intellectual inquiry, he found himself compromised by the tendency of ideology to control the program of art, which Breton and Mathieu, in their different ways, accepted, but Hantaï did not. Hantaï was drawn to surrealism by its engagement with psychoanalysis. How this engagement had come about makes for an interesting story: Breton had been inspired by Freud’s research into the life of the mind from his reading of The Interpretation of Dreams while working as an orderly in a psychiatric hospital in 1919, where he helped treat victims of what was then called shell-shock. From his discovery of psychoanalysis, Breton had formed the belief that art could access the unconscious. This had led to paintings that employed dream imagery, which eventually precipitated an uncomfortable and embarrassing controversy between Breton and Freud. Breton had invited Freud to contribute a text to a surrealist exhibition, only to be rebuffed. In his response, Freud wrote that the surrealists were only presenting the imagery of dreams, without their analysis, which made no sense to him. There was, however, another aspect of early surrealism, known as psychic automatism or automatic writing, which, it was hoped, might open up access to the unconscious. Breton and the surrealists had largely lost interest in this approach, because they felt it led to a hermetic abstraction and could not appeal to a wide audience. On the other hand, as has been stated elsewhere, the American mid-century painters in New York, among whom we should prominently mention Pollock, felt that psychic automatism could offer a genuine path to unconscious experience. Hantaï adopted their position, declaring, as he recounted to this writer, in his letter of resignation from the surrealist movement in 1955 that he intended to pursue the “non-figurative consequences of automatism.” This famous remark places Hantaï, along with these American painters, at the center of the early twentieth-century debate over figuration on the one hand, practiced by Picasso, Matisse, and Bacon, and abstraction on the other, with Kandinsky, Malevich, and Mondrian. In other words, the disagreement between Freud and Breton goes to the heart of this essay’s claim for a modern aesthetic. Freud is making the same complaint about surrealism that this essay makes about the study of modern and contemporary art. There is a willingness to believe that the outward appearance of a work of art has no need of an intellectual and aesthetic understanding to accompany it, just as the surrealist painter believed that the aesthetic object of the painting had no need of analysis. The surrealists had seen that these hallucinatory dream images could have wide popular fascination and be effective in conveying the surrealist cultural program. In due course, this adherence to dream imagery would lead into television, advertising, and pop art. In contrast, when Pollock brought the analysis of psychic automatism to bear on surrealist painting he turned it into modern painting and a statement of the modern aesthetic. For the rest of this chapter, and the full book, email info@paulrodgers9w.com.